I've had this fragrance oil for a month or so and I hadn't decided yet what to do with it.. I had initially thought I'd do a soap based more on it's aquatic side of the fragrance but the floral blend in it is so lovely that I had to include that. So, I decided to do both! On a base of sea green, blending the concept of both the water and the leaves, lays soft white, pink and yellow petals.. all raised up to see the sky! 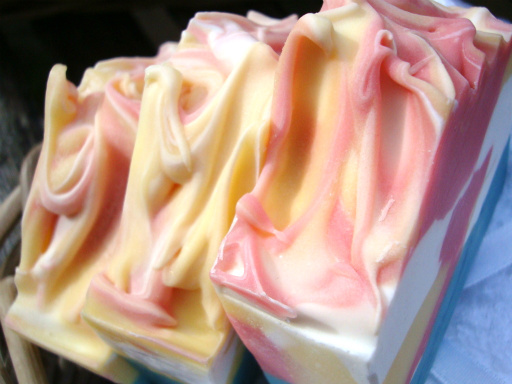 I top the tops on these soaps, I went crazy with the peaks. The fragrance is a wonderful blend of fresh aquatics with a soft floral - its clean and fresh, light and yet lingering. I think it's possibly one of my top 5 fragrances I've used this year. And a definite keeper. I used my usual blend of oils for this - sweet almond, golden olive and lots of cocoa butter; I didn't put in Avocado with this as I had just run out so I upped the Cocoa Butter a little; I can honestly say that its a beauty to use on your skin and the scent lingers just wonderfully well. These will be fully cured by early September - I really hope you like them! Celine I sooooooooooooo love your soaps! You have a fabulous gift and the colours work so well with the fragrance name! Divine Soap! Love love LOVE water lily! I love the design on this one especially the tops. The fragrance sounds like a dream too. Is this a palm free one? 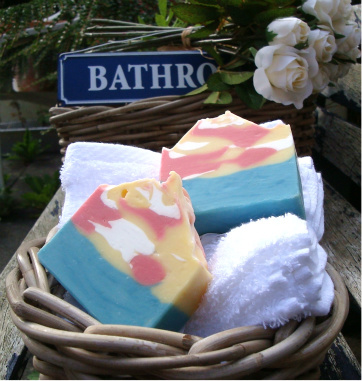 I've been making a lot of palm free soap lately. 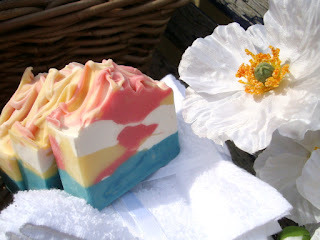 love this soap, the colours are really lovely. 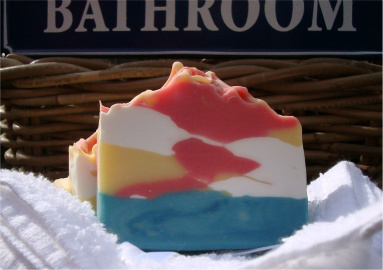 The soap is beautiful. I love hearing how the fragrance inspired you. The colors are wonderfully delicate as is the soft texture on the top of the soap. Gorgeous! it looks beautiful, I really love your colour combination, looks like a sunset over the ocean. 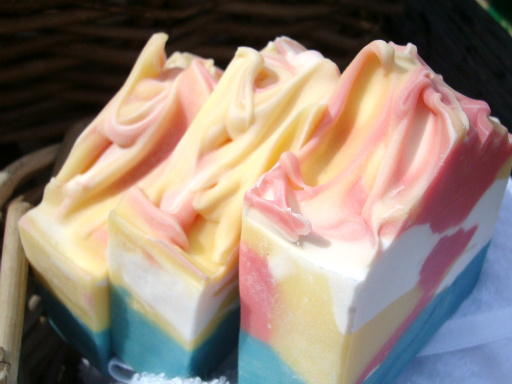 Celine what beautiful soap! The fragrance sounds so transporting I know I'd love it too. The photograph is just top drawer and the Matilija Poppy is so gorgeous.